A lovely place to stay. Very friendly staff, arrived on a late evening flight, mini bus to resort warm welcome from staff and a light meal made for us in the bar as late as 10pm. Comfortable rooms with clean towels every other day,microwave and two ring cooker with plenty of dishes, cutlery,etc. Cleaner cleaned the apartment every day but they do not refill the toilet holder (make sure you provide your own toilet paper ) a lovley quiet area around the pool and nice size pool. Quite deep the one end with a small child area at the top end, but not many children staying there this week. A ten mins walk to the bottom of the hill you can take a new route through the streets to the town every day if you go the other way out of the old town it a 15 mins walk to a lovely beach but it is all down steps from the top of the cliff edges . We loved evrything abount the area and will stay here again. the previous report by myself has been transferred from the old website- these apartments are ideal -just on the outskirts and convenient to walk into town for a meal. Modern block of 28 apartments located within the old town adjacent part of the old roman wall. The apartments are clean comfy and are in a quite area but close to the town centre - 5 mins walk down cobbled hill streets. Fantastic views of the sandy beach at Meia Praia. 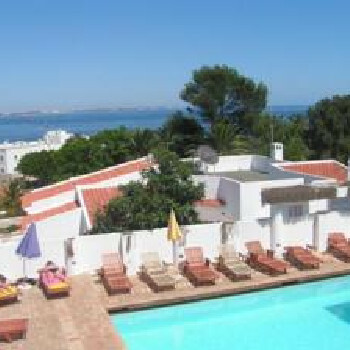 We were first time visitors to the Algarve but had one of our most relaxing holidays at this complex and plan to return shortly to it.